‘Ello BC peeps. I’m Imaginarymoon, a newbie. This is my first article or post on BlogClan. Please enjoy! Tigerclaw- *microphone falls onto Tigerclaw’s head* Oww! You stupid, clumsy, jerk! I know you did that on purpose! Firestar: *nudges Tigerclaw away from Dustpelt* Break it up, man! Dustpelt: *blows a whistle* The fight is over! *he sighs* Lets just get this show on the Thunderpath. Tigerclaw: Daaad! Are you serious! Dustpelt: Cut! Tigerclaw! What are you doing?! Pinestar: What? That’s what the script says! Tigerclaw: *sarcastically says* mmmhhhmmmm! I’m sure it does. Pinestar: Welcome to the series premiere of Rivals Debate Club! I’m your host, Pinestar. Today I’m with two pompous cats: Tigerclaw and Firestar. These two have been rivals for many moons. As we know, a prophecy was received by ol’ Spotty when Firestar was just a ‘paw.’ “Fire alone can save our clan.” It meant that Firepaw will save ThunderClan from Tigerstar. *rolls his eyes* Let the debating begin! Tigerclaw: *grins* I’ll go first! Firestar: ‘K. Don’t go to into it, you need to save your energy for all of that weeping when you lose. Firestar: *rolls his eyes* All leader are chosen that way, mouse-brain. Tigerclaw: *glares at Firestar* Don’t interrupt me, please. 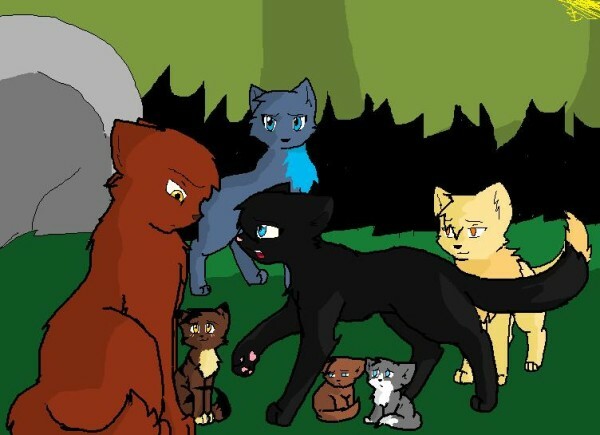 So back to me being the leader of ShadowClan. I remember when that RiverClan elder mistaked me for Oakheart and told me about Bluestar’s kits! I also enjoyed the time when I, being the genius that I am, lead a pack of dogs to kill you, but that mouse-brain Bluestar saved but ended up falling off with the dog. Basically, win, win for you and me. Try to top that! Firestar: Challenge accepted. Hey, do you recall when we fought against each other in that Dark Forest battle? Firestar: *chuckles* I can still remember the look on your face after you failed to cut my throat. I just came at you like a boss, and sunk my teeth into your fatty neck! Then you died! Tigerstar: I can obviously tell that I died! Don’t forget that I killed you, too! Firestar: *sighs* Yeah, I know. Firestar: Wait, I’m not done. How rude of you to say that! First of all, I obviously have more cats on my side. Isn’t that right guys?! *Viewers nod* I brought back WindClan when they were driven out. I saved ShadowClan from Brokenstar. I saved ThunderClan from YOU. I always make bright decisions. I also brung SkyClan back from when the twolegs destroyed their territory! Now you top that! Tigerclaw: *glanced helplessly around* Well Lionblaze was taught by my ways. He is one of the most powerful cats around thanks to me! Firestar: *sighs* I don’t think that’s how it went. Firestar: You had to have the speakers right by me. Well, I had fun writing this article, and I hope you guys enjoyed it! Tell me if you want another one. I’m open to any requests on who I should debate with. 16 Responses to "Rivals Debate Club w/ Tigerclaw and Firestar by Imaginarymoon"
Amazing, Moony! Nice to see you on the blog! This article was amazingly funny! I can’t do anything like it, and welcome to the blog! However, I have one thing to comment on: Tigerstar was killed two times. He was already dead by the time that Firestar killed him again, so if that’s it, then Tigerstar just wouldn’t EXIST anymore. Firestar will exist, because he only died once, but Tigerstar was killed two times, so he doesn’t. The ending was really funny, I like it. So, again, this was one of the best articles I’ve read! And, AGAIN, welcome to the amazing blog that is BlogClan!